South Somerset District Council: Pure Town Planning have recently secured planning permission for alterations, extensions and change of use of an existing public house (A4 use) to a convenience store (A1 use) with one flat above (C3 use) in Templecombe, Somerset. The existing public house, known as the Templars Retreat, ceased trading in mid-2016 and the building remained vacant since then. In April 2018, the property was listed as an Asset of Community Value (ACV) by the Council. During the initial six-week moratorium period no eligible community group came forward as a potential bidder and therefore the six-month moratorium period was not triggered. Subsequently, we submitted the planning application for the proposed change of use and other works, which was then approved in January 2019. The proposed development, which was designed by Union Architecture is to be laid out over two floors. The ground floor provides a convenience store with 217 square metres of net tradable floor space (A1 Use) and 110 square metres of floor space for back of house operations. The upper floor will be converted into a spacious three-bedroom flat for the private market. To achieve the floor space required the existing building is to be extended to the rear with a single storey extension. The proposed extension has been sensitively designed to ensure it has a subservient relationship with the existing building and input was sought from the Council’s Conservation Officer prior to submission. Externally, the proposed extension will be constructed from traditional materials and feature a parapet to give the appearance of a hipped roof from street level. The proposed development will provide 14 off-street parking spaces (2 of which will be allocated for residents parking) and Sheffield bike stands for secure bicycle storage for staff, customers and residents. The application was supported by a comprehensive transport statement and service management plan prepared by Croft Transport Planning which demonstrated the level of parking provision was sufficient and safe ingress and egress could be achieved by delivery vehicles. As part of the application, we prepared a comprehensive supporting design, access and planning statement which set out the merits of the proposal in a clear and concise manner, whilst making it clear that the proposals were in accordance with adopted planning policies that support the provision of new community facilities and new homes within villages through the reuse of existing buildings. We argued that proposed convenience store will provide an alternative community facility for residents that will reduce the need to travel outside the catchment area, which will subsequently benefit the local environment through a reduction in car journeys and emissions. The reduction in travel times will also have social benefits for local residents, as they will have the option to walk to the proposed store. Upon considering the application and supporting documents, Officers agreed with our conclusions and moved to recommend the scheme for approval. 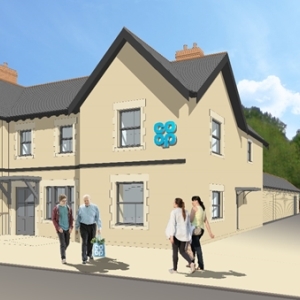 The convenience store will be occupied by the Co-operative and the new store will have an emphasis on fresh food and it will stock a wide range of fruit and veg, award winning fresh food and British meat and poultry. There will also be an in-store bakery that will serve fresh bread and cakes. The development will create approximately 22 permanent jobs which will provide a significant boost to the local economy. If you have a commercial premises or vacant brownfield site and would like to pursue a change of use application, or any other commercially-related planning application for that matter such as; increasing opening hours, new shopfronts, new signage, canopies etc. then why not call Pure Town Planning on 01202 585524 or email info@puretownplanning.co.uk for a FREE 30 minute consultation on how we can help you.